If you enjoy a flavorful beverage rich in nutrients, the answer doesn't necessarily sit in a bottle or carton. 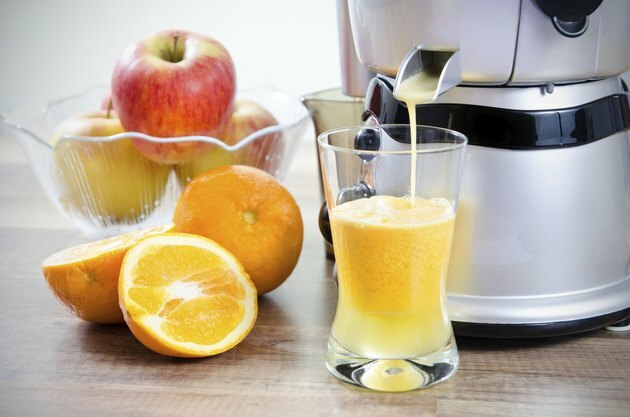 With a juicer and a selection of your favorite fruits and vegetables, you can whip up a healthy drink that's not only healthy, but also easy to digest. If you watch your calories to avoid weight gain, ensure your juicing habits don't lead to a significant caloric intake by carefully choosing the drink's ingredients. If you want to keep your juice's caloric value on the lower side but still enjoy a fruity flavor, several low-calorie fruits are suitable. Two 3-inch slices of pineapple have 50 calories, as do one medium tangerine, eight medium strawberries and one-quarter of a medium-sized cantaloupe. Other low-calorie fruits to consider include grapefruit, which has 60 calories per half; peaches, with 60 calories per medium-sized fruit; and plums, which have about 70 calories per two medium-sized fruits. Several fruits provide a burst of flavor but contain around 100 calories per serving. One large apple has 130 calories and a medium-sized banana has 110 calories. Servings of fruit that total 100 calories include one medium-sized pear or a cup of sweet cherries. Grapes have 90 calories per three-quarter cup and a pair of kiwis also provides 90 calories. One medium-sized orange has 80 calories. Most vegetables appropriate for using in a juicer aren't overly high in calories. One-third of a medium-sized cucumber has just 10 calories, while two medium-sized stalks of celery have 15 calories. One medium tomato has 25 calories and broccoli has 45 calories per medium-sized stalk. A 7-inch carrot has 30 calories. If you're concerned about calories, stay away from sweet potatoes. Despite their sweet flavor, they have 100 calories per medium-sized potato. If you're new to juicing, it can take some time before you find the right blend of flavor and calories. Helpful tips include combining earthy-tasting vegetables or leafy greens with flavorful fruits such as apples or oranges. Lemon, which has just 15 calories per medium-sized fruit, adds a bright splash of flavor without significantly boosting the drink's calories. Water-rich vegetables such as cucumbers and celery help keep your juice on the lighter-tasting side, although juice with these vegetables often separates if you leave it the fridge. In this case, stir the drink before enjoying it.